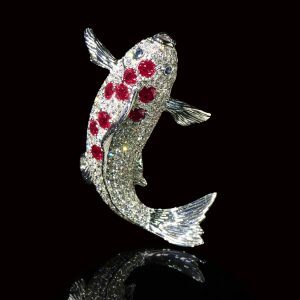 Maison Guan is a newly established jewellery design house operated by its founder Simon Kwan. “Guan” is the modern pinyin translation of his Chinese family name. Simon Kwan was trained as an architect and has practised in Hong Kong since 1967. He is also an art historian with a Ph.D in Fine Arts and has published over 20 books on Chinese art. His jewellery designs are unanimously inspired by nature and demonstrate his ability to integrate line, form, colour, texture and space into a tiny piece. Contrasts of order and disorder, solid and void, curved and straight, hard and soft combine to create memorable pieces of fine jewellery.